Chicken wings are typically not a traditional smoked meat due to the popularity of frying chicken wings and coating them in a buffalo sauce. Fried chicken wings only take 6 minutes to cook compared to 2 hours to smoke them. The only restaurants that invest the time to smoke chicken wings are barbecue restaurants that have access to large smokers and understand the complex taste of smoked meat. 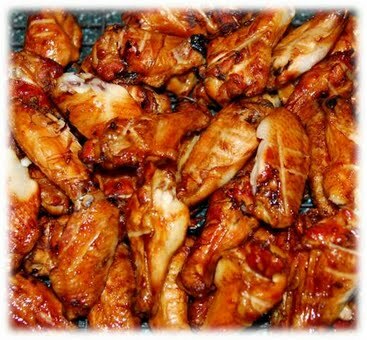 The smoked chicken wings recipe below will teach you how to smoke the chicken wings in a step by step process that makes it easy for an amateur who has never smoked meat before. Feel free to use any store bought rub seasoning or craft your own with ingredients you find around the house. See below for a great this recipe that can't be recreated in a fryer! First step is to fire up the smoker and get the coals burning white hot. Soak your wood chips and throw them in a foil pouch or use wood chunks that will smoke longer. Throw these on your smoker when the coals are white hot. Coat your chicken wings with the rub ingredients. One easy way to do this is to put all of your ingredients in the 5 pound bag your wings came in or a zip lock bag and shake the bag to fully coat the wings. Line your smoker grate with the chicken wings and close your smoker grill lid. Since your chicken wings will cook quickly compared to other smoked meats, you shouldn't need to replace the charcoal or smoker chips. Check the internal temperature of the chicken wings. You are looking for a temperature of about 160 degrees Fahrenheit before you can pull them off the smoker. You can either eat these smoky wings dry or serve with ranch, barbecue, or buffalo dipping sauce. Smoked chicken wings take about 1 1/2 hours to 2 hours to smoke throughout. If you don't have a meat thermometer, a way to tell if the chicken is done is to poke it deeply with a knife, if the juices run clear and not pink, the chicken is done. We always recommend using a meat thermometer in conjunction with our meat temperature chart to make sure you remove all meats from the smoker at the prefect temperature.